As a continuation of my Google Glass project, my next step is to write Hello World on Google Glass using Infor Process Automation (IPA). As a reminder of my project, I’m writing an application to show M3 picking lists on Google Glass using Event Analytics and Infor Process Automation to have rich interactive picking lists in Glass with a list of items to pick, quantities, stock locations, item image from Infor Document Archive, and walking directions on a warehouse plan. My IPA server is located in a Local Area Network (LAN) at the office behind a firewall. Note: For the purposes of this proof-of-concept I bootstrapped the OAuth 2.0 token manually by copy/pasting it from another computer where I already had the Android Development Tools (ADT) and the Glass Java Quick Start Project. 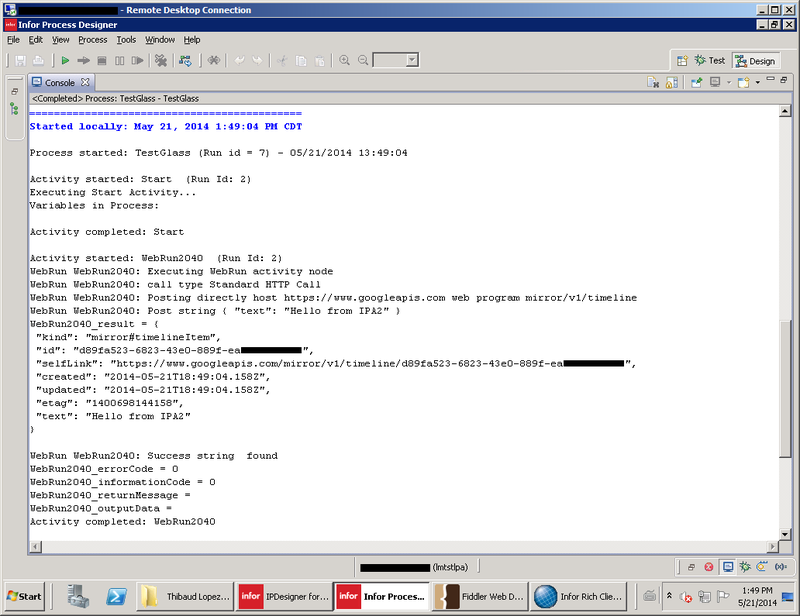 IPA can make HTTP Requests using the Web Run activity node. With WebRun, we can specify the following parts of an HTTP Request: scheme (HTTP/HTTPS), host, port number, method (GET/POST), path, query, Basic Authentication, HTTP Request Body, Content-Type, and HTTP Request Headers. I didn’t know where to set the scheme (HTTP/HTTPS); the Web Root seemed to me like it was only used to set the host and port number. The User id and Password fields seem to support Basic Authentication only, not OAuth 2.0. I need to set the OAuth 2.0 token as a variable because it expires and must be renewed every hour, but the WebRun activity node doesn’t support variable substitution in the Authorization header (CTRL+SPACE and <!var1> are not supported). I didn’t see the Header string field at first because when the input field is empty it has no border which makes it hard to spot. The Header string occupies only one line of height so it seems to indicate that it only accepts one HTTP Request Header. The Content-Type field didn’t propose application/json in the drop down list, so I had to hack into the LPD file with Notepad and write it and XML-encode it manually. The WebRun failed to execute and returned an HTTP 400 error without additional information. We cannot set a proxy like Fiddler in the WebRun configuration to intercept the HTTP Request (header and body) and HTTP Response (header and body) which makes it hard to troubleshoot. The WorkUnit log only shows the HTTP Response body which is only a quarter useful. 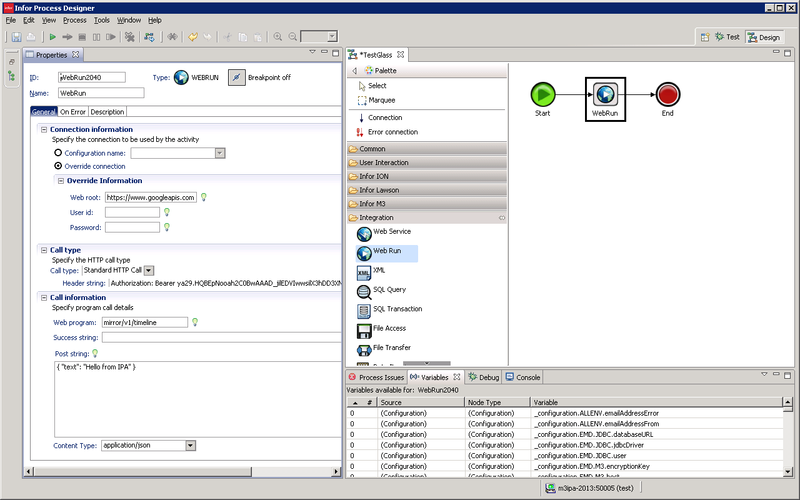 The scheme can be set in the Web Root (as shown in the screenshot above). The OAuth 2.0 token can be set in an Authorization header in the Header string (as shown in the screenshot above). Samar said he will add variable substitution to the Header string. Samar said he will make the Header string field wider. Samar said he will make the Header string field multi-line. Samar said there is a new version of IPA that adds application/json as a possible Content-type. Samar said that’s a known problem with Content-type application/json and there is a bug fix available to correct it. Meanwhile, James said I can add it as an additional Header string; for that I had to use Notepad again to add the two Header strings on two lines. Also, Samar said he will attempt to upgrade my server with the new version of IPA. Samar said he will look into adding an optional proxy configuration for host and port number like we can do in web browsers. Samar said he will look into adding an option to log the full HTTP Request and Response. After that collaboration we had a working proof-of-concept within 20mn. The next step will be to get the OAuth 2.0 token automatically, and to display the M3 picking list onto Glass. 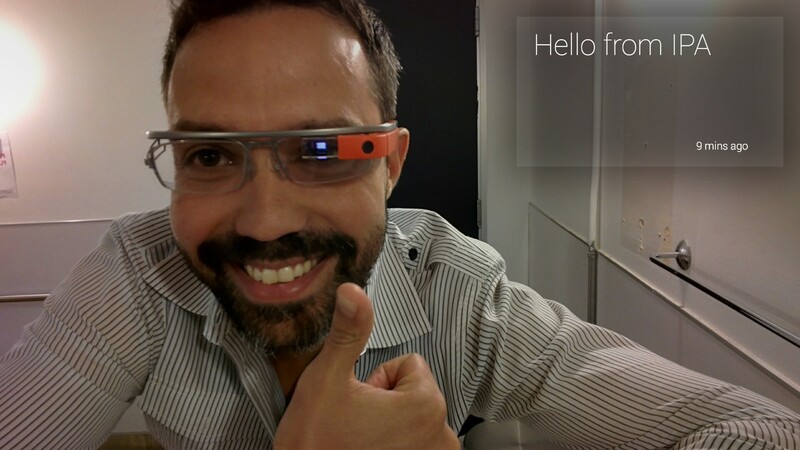 That was a proof-of-concept to write Hello World from Infor Process Automation onto Google Glass using the WebRun activity node to make an HTTP Request to the Mirror API. I want to specially thank James Jeyachandran and Samar Upadhyay for their support and responsiveness, and for their enthusiasm with this project. They will be at Inforum 2014. Like. Comment. Share. Subscribe. Enjoy. UPDATE: Unfortunately, I conclude it’s currently not possible to send an image to Google Glass using IPA because IPA seems to stringify binary data and it causes data loss in the image bytes and makes the image non-processable. I tried using the latest IPA version of July 2014. 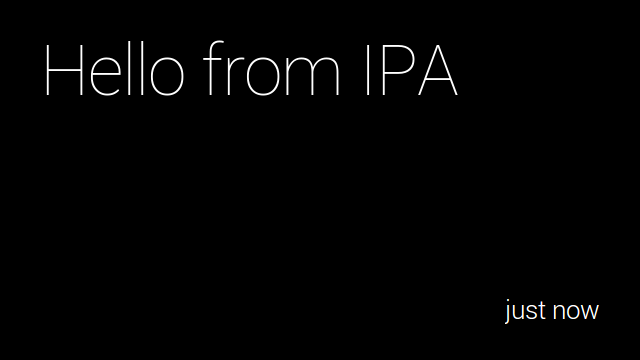 IPA can still send regular text to Google Glass. We are using Product Version: 10.1.1.2 and still only have access to the Standard HTTP Call – POST. I need to call a REST service with GET, POST, PUT & DELETE. I’m looking into other options, unfortunately the CustomActivity doesn’t seem to give us an API to follow if I wanted to create a class to do the http calls. The only other way would be a system command calling a bespoke , which sort of defeats the purpose. Any ideas I could look into? I don’t have the servers anymore. All I could find was a screenshot with Infor Process Designer 10.0.3.10…5662 2013-04-12; I couldn’t find a screenshot with the version of IPA Runtime. Regarding your question about the GET method, I had stumbled upon the same problem as you. In theory, if we set a POST string in the activity node then IPA should use the POST method, otherwise if should use the GET method. It turns out there’s a bug in certain versions of IPA. In June I had de-compiled bpm-commons.jar and had proved the bug to Samar. I can’t recall the entire history of the conversation, I think James and Samar said they would fix that and other bugs in the next version of IPA. Samar said CU3 version 10.1.1.3. In August I had upgraded IPA and I think you can now choose the method. And there are some new features I had asked for. Some of the bugs I reported persist though. I don’t remember all the details. My suggestion is you upgrade. Wow thanks for a quick response and trying to dig up what you could. I’ve emailed our consultants to ask for about the latest build and will follow that route.